Mumbai 13 September 2016: Dragon fruit is such an amazing fruit for our health. Today we will show you how you can replace your store bought jams with this tasty all natural jam. Making this homemade dragon fruit jam is very easy. Dragon fruit jam goes well with anything. You can use the jam as a topping or spread, Children don't mind eating it plain as well. 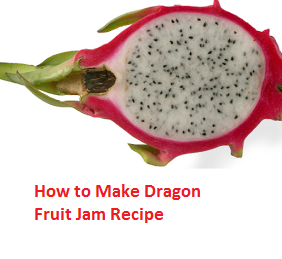 Today we will tell you how to make dragon fruit jam at home with just a handful of ingredients. Take a mixing bowl and add dragon fruit pulp, eggs, lemon juice, butter and sugar. Now mix this mixture well till everything has combined properly. Pour this mixture into a double boiler and cook over low heat for an hour. Stir the mixture frequently as it cooks. The mixture will start to thicken as you stir. Once the mixture reaches a jam like consistency put the gas off. Once it's at room temperature pour the mixture in a glass jar with a tight lid and store it in the refrigerator to use it later. Your tasty plain dragon fruit jam is ready to be enjoyed.